A few weeks ago, I mentioned in my blog that we are part of the Vtech DigiGo Ambassador Campaign with tots100 and over the next three months, I will bring you some interesting news from Vtech. This month, I am hosting the giveaway for one of my readers to win a brand new Vtech DigiGo worth £79.99! Vtech DigiGo is a hand held smart device for children aged 3 to 7. Besides the usual features like taking photo and videos, playing learning games and using the multimedia player, this Vtech DigiGo allows your child to send and receive text or voice messages, photos, drawing and much more with (parent-approved) family and friends’ smartphones using the built in wireless connection. 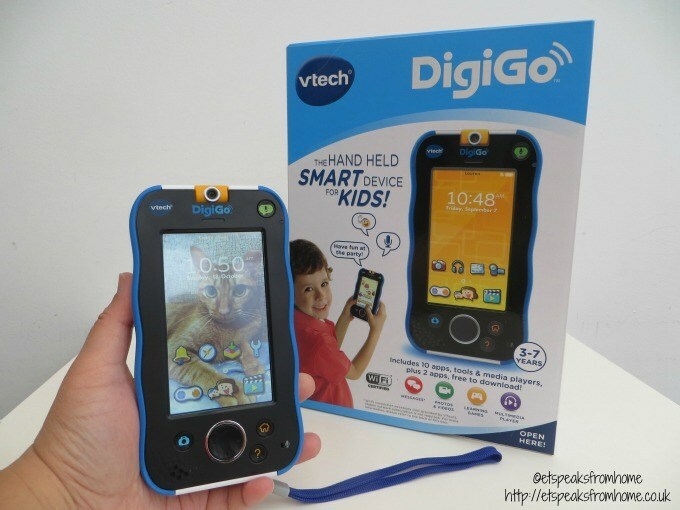 If you have not read my Vtech DigiGo’s review, do click the link and read more about it. Or you could watch my YouTube review. Share your story on my Facebook Page using hashtag #DigiGoetiquette before you could enter the rest of the entries. These are my #DigiGoetiquette children’s selfies. Two years ago, I passed down my old camera to Ms C and she used it to take photos and video. Recently, I was clearing her SD card and found her selfies on it! Can’t believe she used to be so chubby! Your details will be passed to tots100, but will not be passed onto any third parties by ET Speaks From Home. The prize will be sent directly to the winner from tots100. Competition starts on 13/11/2015 12 am – 27/11/2015 11.59pm. Disclosure: I am a Vtech DigiGo Ambassador with tots100.